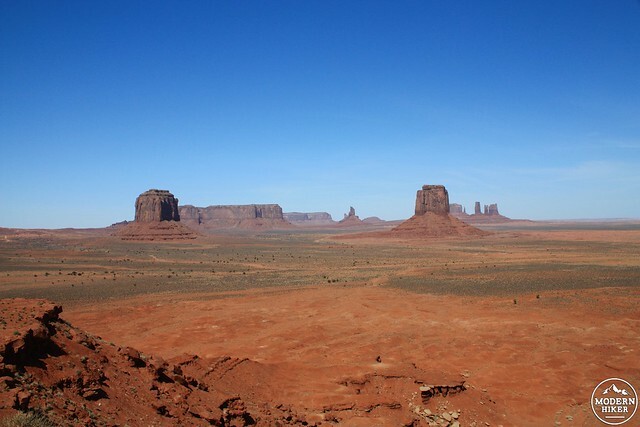 Perhaps no other single location in the world is more uniquely identified with the American West than Monument Valley. Of course, others had been living in the area for centuries before the U.S. Army came through. Between 1100 and 1300 CE, the Ancestral Puebloan culture that lived in the region became a culturally distinct group called the Diné (or Navajo). There is little evidence that Spanish explorers ever saw the region, although the evidence of their sad effects on Native societies is well-documented. When the land came under American control, the U.S. Army attempted to force the relocation of the Diné 350 miles east in New Mexico when a band led by the colorful figure Hoskininni evaded capture by fleeing through Monument Valley. 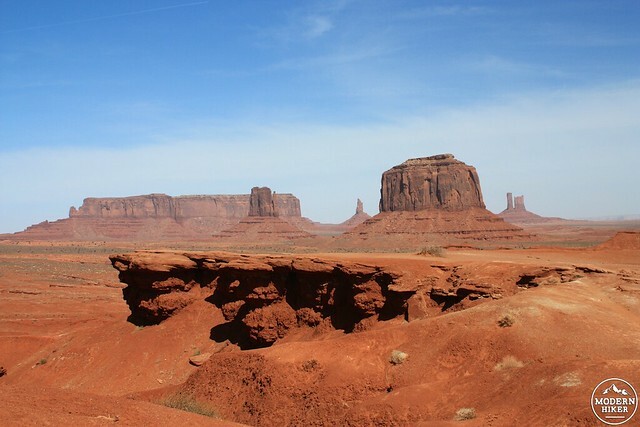 Eventually the U.S. government signed a treaty with the Navajo and established a reservation, which eventually grew to include the land of Monument Valley. Still, the Valley was unknown to most – as the nearest railroad station was a very difficult week-long overland trip away in Flagstaff. The Park Service was interested in protecting the area in the early 1930s but the land was a patchwork of private and tribal land and they ended up passing it over. Full attention didn’t come until 1938, when Harry and Leone Goulding – who ran a small trading post just outside the Valley – travelled to Los Angeles after hearing Hollywood was looking for new locations for their Western films. There’s an incredible story about the couple threatening to camp out in the lobby of United Artists until they could meet with an executive. 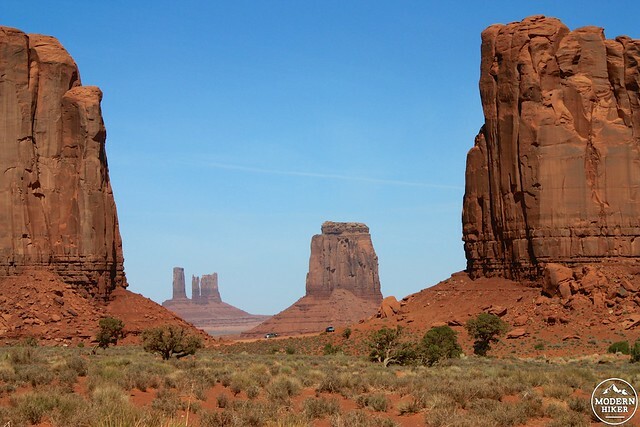 When the exec came to throw them out, he saw a photo of a Navajo on horseback in front of the Mittens and immediately set up a meeting with the director John Ford, and next year his film Stagecoach (starring a then mostly-unknown John Wayne) brought Monument Valley to the rest of the world. 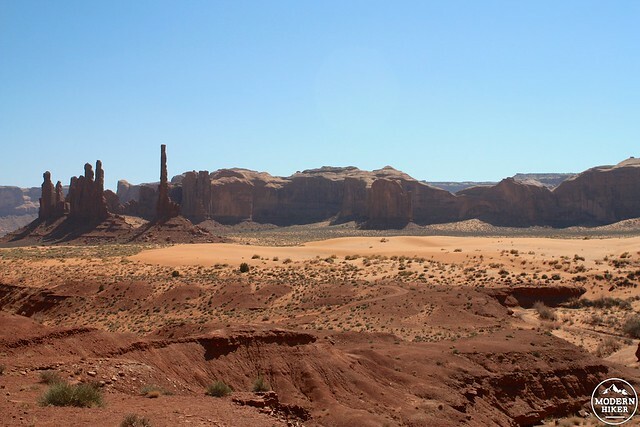 Ford would shoot nine more Westerns in Monument Valley (including The Searchers, one of my all-time favorite movies), forming a long-lasting and mutually-respectful relationship with the Navajo. 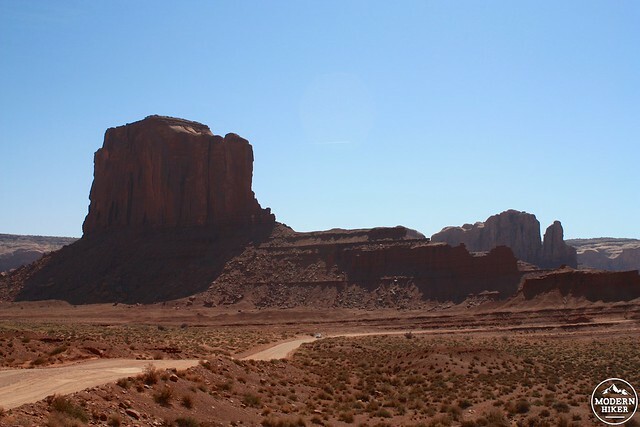 The Valley itself continued to be inhabited and was even mined for uranium from 1948-1967, one year before the Navajo Nation established Monument Valley as their first Tribal Park – following the model of the National Park Service. Today, visitors approaching the park will feel its presence long before they reach its boundaries. When you’re driving along a wide-open desert road presented with an even wider-open desert sky and scenes like this, it’s hard not to feel like you’re in someplace very, very special. You’ll enter the 29,817 acre park just off US-163, pay your entrance fee at the gate ($20 per vehicle at the time this was posted), and head to the newly built visitor center. There, you can visit a great museum about the history of the Navajo Nation and Monument Valley, a well-stocked gift shop with locally made goods (although you’ll have plenty of other opportunities to purchase goods on the trip as well), a restaurant that overlooks the Valley, and a place to hire a Navajo guide to take you deeper into the Valley. From the Visitor Center, you’ll also have an incredible panoramic view of the Valley itself – the iconic Mittens and Merrick Butte – and that should be just about enough to make you want to run back to your car to get going. 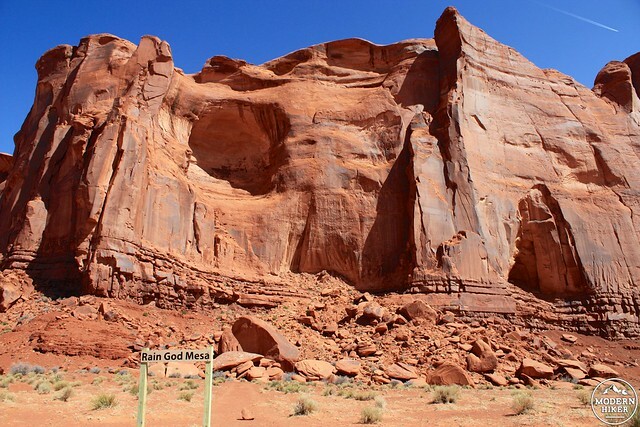 The Valley Drive is a 17 mile unpaved dirt road that follows a lollipop loop around Rain God Mesa, with several short spurs to overlooks and points of interest. 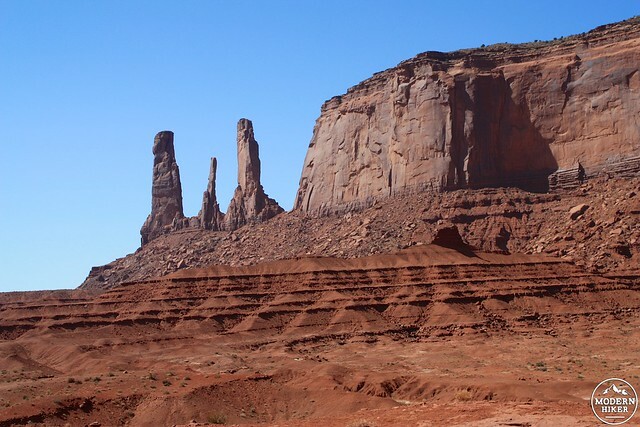 Although this is an auto tour and many of the stops along the way have makeshift shops and stands selling Navajo goods, it is very easy to overlook the human presence and get completely wrapped up in the beauty of the area itself. At John Ford Point (stop number 4 on the drive), visitors can get one of the best panoramic views of the Valley – and film lovers may find the scene very familiar, as Ford used it in many of his Westerns. 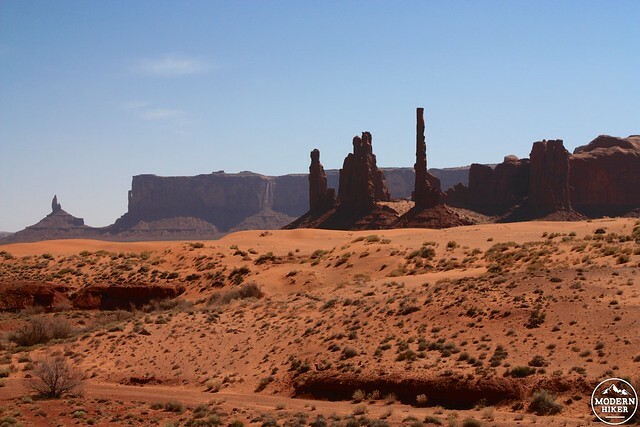 There’s also a permanent Navajo jewelry shop nearby, and on most days you can recreate your own photo version of the Duke by paying a few dollars to hop on the back of a horse with Monument Valley as your backdrop. After visiting Ford Point, the road becomes one-way at Camel Butte. Head south and the road will swing around the southwestern rim of Rain God Mesa right before Thunderbird Mesa and enter a narrow valley between the two formations (a road leading south from here will take you to some arch formations, petroglyphs, and Puebloan ruins but is only accessible with a Navajo guide). The wall of Rain God Mesa has some interesting erosion effects, and from the viewpoint here you’ll spot the thin spires of Yei Bi Chei as well as some large sand dunes that press up against Thunderbird Mesa. At the next stop, the grouped spires of Yei Bi Chei and the lone tower of Totem Pole rise up from the thickening red sand dunes. The view from the Artists’ Point Overlook is another one of the best views in the Park, with sweeping reversed views of the Mittens and Merrick Butte. And one of the last photogenic spots on the Valley Drive is the North Window Overlook, where a side-angle of East Mitten Butte is perfectly framed by Cly and Elephant Buttes. There is a short walking path here that will bring you to some very nice views as well, but this small turnout can get crowded. When you’re done, return back to the visitor center for a bite to eat … or head a few miles outside the park to visit the old trading post the Gouldings once operated, still in business and still playing free John Ford films for visitors every day. Note: If you are traveling here in the winter, be very aware of the time. Utah observes daylight savings time while Arizona does not. However, the Navajo Nation does observe DST – but not all smartphones that automatically switch to new time zones recognize these boundaries. This is a driving tour along a 17 mile unpaved dirt road, although there are a few stops and overlooks along the way. 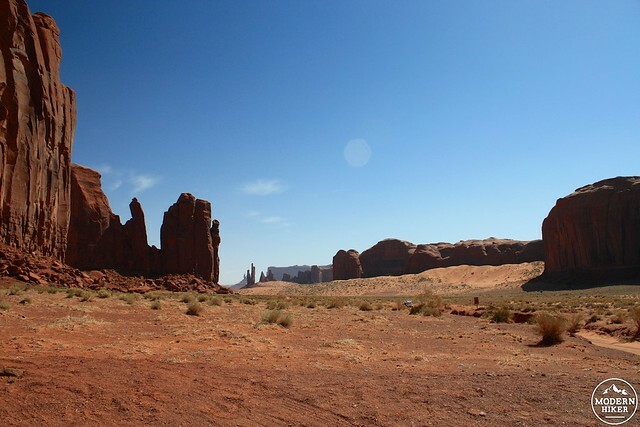 Monument Valley Navajo Tribal Park operates a primitive, first-come, first-served campground near the entrance to the Valley Drive. Call 435-727-5870 for more information. Developed campground and cabins are for rent at nearby Goulding's Lodge and Trading Post. Monument Valley Navajo Tribal Park is located approximately halfway between the town of Mexican Hat, Utah and Kayenta, Arizona. 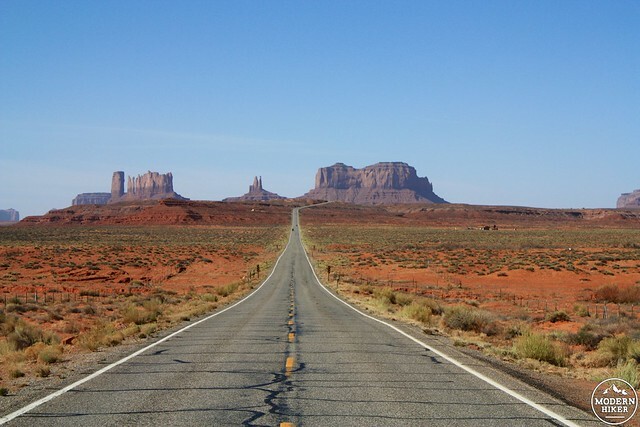 From Mexican Hat, head south on US-163 for 22 miles; from Kayenta, head north on US-163 for 24 miles. The entrance to the park is clearly signed. Pay your entrance fee - there is a museum and visitor center that serves as the base of tourist operations here. The 17 mile auto tour begins just outside this parking area.